This 3-week healing plan will assist you in healing the deeper beliefs and emotional patterns that feed depression. Depression is often a generational pattern. You are the one to change the pattern and release this energy from your family story. It is important for you to see yourself getting well, and to also learn the lifestyle that supports wellness. This includes diet, sleep, self-talk, media choices, supplementation, and fitness. At the end of this 3-week healing plan, you will have cleared the negative patterns that feed the energy of depression so you can create a healthy lifestyle that keeps you depression-free. Disclaimer: This is not a medical plan to treat mental illness. Please see a medical professional for medical treatment if necessary. Carol also recommends you learn more about brain health in the book, Change Your Brain, Change Your Life, by Dr. Daniel Amen. Besides healing the deeper beliefs and emotions connected to depression, learning about diet and supplementation to support healthy brain function is recommended. 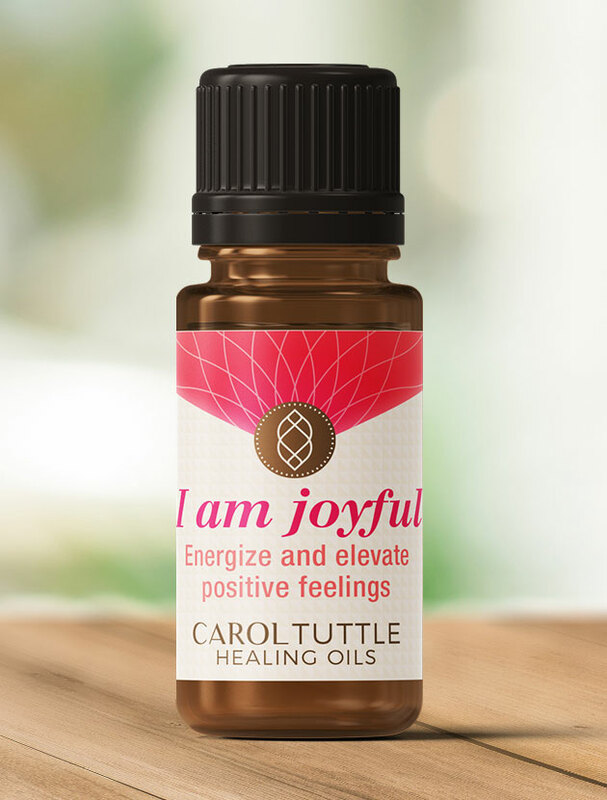 The oil customized to support you in this Healing Plan: I am joyful. The list may look long, but the techniques are quick once you’re familiar with them. Listen here or download and listen on the go. This audio session is supportive to listen to first thing in the morning and any time throughout the day when you feel low. Listen here or download and listen on the go. Depression can become a lifestyle that affects your inner talk and perception of the world. These affirmations recognize that we already carry the peace we seek with us. Use these affirmations to train your mind to connect that peace at any time. These simple techniques help you start your day in a positive energy. Make them part of your morning routine and use during the day if you feel your energy sinking into depression. Do a Creation Walk for at least 5 minutes a day. If you have limited time, commit to doing it twice per week for at least 10 minutes. Use the process of this walk to help the generational story of depression end with you. As you begin to see your life free from depression, you will set into motion the energy to create it. Each day, finish one or more of the following sentences in a journal or notebook. Write quickly. No overthinking. See what comes up. List all of the people in your family who have had depression. Send them all the energy of healing. Act as if your depression is healed and list 10 things you are now doing as a result. Sound healing, using Tibetan healing bowls, helps you process, clear, and ground your energy. They activate your energy centers to help you express your true self with more ease. Listen to this track while you do your creation walk, 2 Techniques to Make Every Day Pleasurable, daily journaling, or as you fall asleep at night. This general depression clearing will support you in letting go of hidden emotions and beliefs that keep you stuck in the energy that feeds depression. Everyone has residue from their childhood family experience, including you. Hidden feelings and beliefs you carry from your childhood are depressing. This healing session will assist you clearing them so you can start to feel the joy of the past, present and future. It will also allow you to forgive your family of origin, especially your parents, as they were wounded as well. Daily stress keeps you stuck in a pattern of manifesting daily events that are stressful. This stress energetically feeds the pattern of depression. This session will help you take each day at a time and create daily peace and well-being. Mind training is an important part of being free from depression. This healing session will help you tap into the ever-present energy of joy and teach you how to replace depressed feelings with joyful ones. Watching this session again this week will support you in maintaining the energy you cleared last week. You will watch it again next week, too. Since depression is often generational, your subconscious mind may believe depression is a necessary state. Your mind and body may be so used to feeling depressed that they are addicted to this energy. This healing session will teach your mind and body that you no longer need depression to feel alive and safe in the world. If you have experienced the pattern of depression for an extended period, you may subconsciously believe you “need” it. It is not important to identify why you would need it in order for this session to work. Just use any of the following set up statements in this session: I need depression, I need to feel bad, I need to feel lifeless. If you are carrying old “stuck” energy, letting go of the pattern of depression will be more difficult. Let’s clear that energy away. Go through this exercise again. Repetition helps to ground the new, healthy pattern. Anxiety is usually connected to depression. This clearing will help you get free of any anxiety that feeds the pattern of depression. This healing session uses positive affirmations only. It supports you in focusing on the positive in both thought and language as you tap on the body. It will support your body in holding a higher vibration, as it is used to feeling the lower vibration of depression. Imagine your life free of depression. What would you feel? What would you look like? What would you be saying? How would others treat you? What would you be doing day to day? Invite the energy of the Tibetan healing bowl to help you create a life where you are whole. Set the intention that in the near future, you will look back at your life and remember when you had depression now that you have healed it. This session will help you clear any energy you still carry from your pre-birth that could be contributing to your depression. Sodalight: Absorbs and neutralizes the clouds of mental disharmony that bog down the mind and make you feel burdened. Sodalight also clears your physical body of the negative mental energies that disrupt the body’s functioning and perpetuate disease. Sodalight restores your physical vitality and helps reveal your true nature, strengths, and life’s purpose. Carnelian: Nourishes and vitalizes your entire being, bestowing you with optimism and enthusiasm for life. Carnelian enhances mental clarity and positive emotions, promoting a brighter outlook and an appreciation for your life lessons.